So, you’re pregnant and hormones are coursing through your body like a teenager on prom night. One minute you’re hot, the next you’re cold and every day you and your favorite jeans grow further apart. You may also notice there has been another result of your pregnancy: dry mouth. That’s right. As if you weren’t dealing with enough already, you might also be walking around with your mouth feeling like you chewed on a pair of baby socks. It’s not fair. And we feel for you. So, we’re here to help out. First, we’ll help explain some of the causes of dry mouth during pregnancy and then we’ll provide some tips to relieve it. Dry mouth is a side-effect of some prescription or OTC drugs you might be using during pregnancy. But, of course, you should talk to your doctor before considering any changes in medication or dosages. Blood volume in pregnant women can rise up to 50% more than non-pregnant women. Which means your organs are working overtime leading to more urination and potential dehydration. 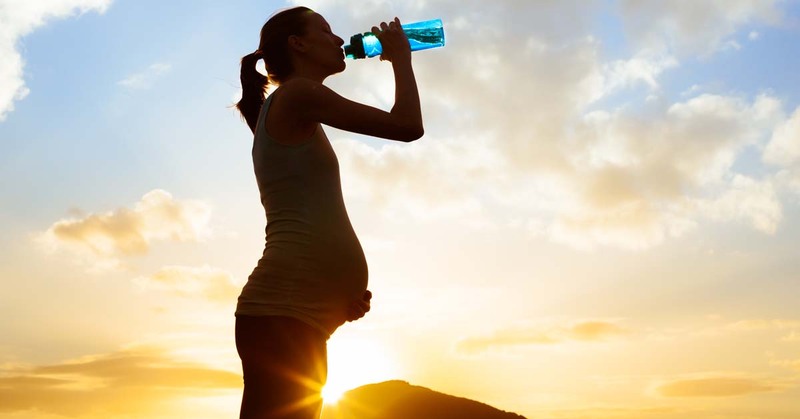 Dehydration in pregnant women can be common. Your body is forcing you to take in more water, which means eight glasses a day might not be enough while you’re pregnant. You’re basically running a marathon all day, every day for nine months. If only you could convince a crowd to stand around you with encouraging signs and nonstop cups of water. Yep, you knew this one was coming. Your hormones can cause a reduction in saliva and a myriad of other issues that lead to dry mouth. When Can You Expect Dry Mouth During Pregnancy? For some, dry mouth begins immediately. In fact, it’s important to talk to your doctor about dry mouth, because it could be a sign of gestational diabetes, commonly called pregnancy diabetes. A simple glucose test performed by a professional will help determine if this is the case. Can Dry Mouth Indicate Other Health Issues? Besides pregnancy diabetes, dry mouth could also be an indication of other health issues including (but not limited to) anemia and hypertension. Even if dry mouth seems like only a nuisance and you aren’t experiencing pain or burning sensations around your mouth or throat, it’s important to talk to a doctor about any symptoms you may be having. And keep them aware of any changes throughout your entire pregnancy. As stated, eight cups aren’t going to do it for you anymore. Bump up that water intake immediately and keep a glass around you at all times. A weird tip, sure. But, the less contact your mouth comes with the air outside, the more moisture you’ll keep inside. Overly salty or sugary foods or drinks can cause dehydration in all of us. But, this is especially true for someone who’s pregnant. If you can’t live without flavor for nine months, consider a sugar substitute that’s natural and safe (ask for a recommendation from your doctor or nurse). Pumping extra moisture into the air, especially during hot and dry months could help you stay hydrated longer. ADA approved sugar-free gum can stimulate saliva production and provide some much-needed relief from all that water drinking. Drinking water isn’t the only way to get the clear stuff into your body. Fruits and vegetables contain a lot of water and provide excellent nutrients that aid you and your baby. And, if these solutions aren’t enough to whet your whistle, consider talking to your doctor or OBGYN about using OTC products like SmartMouth Dry Mouth Mouthwash or SmartMouth Dry Mouth Mints. They are proven to help provide temporary relief from dry mouth.